In 2014 catalogue album downloads outsold downloads of new albums in the US. This is the first time in history that, over the course of year, old music has outsold new music. Now this is just the case for the American figures for downloads, but the above graph shows sales on all formats and it shows a worrying trend. 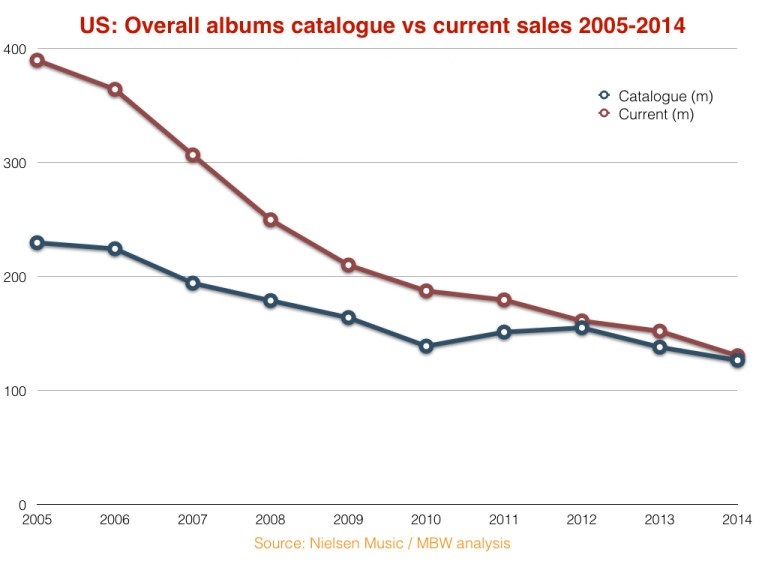 At this rate new music will soon be outsold on all formats. Many would be quick to cite this as evidence that old music is simply better than modern music (a topic that I myself am bound to have a more in-depth discussion of at some point) but there are other contributing factors. It could be that people are more likely to use streaming services for chart music than older catalogue albums, or it could be that (since ‘old’ music in this study is defined as being released over 18 months ago) people need time to decide whether an album is worth buying or they are waiting until the price drops. Whether the cause is music quality, music cost, changes on how people listen to it or a combination of the three, it should be an alarming wake up call for the industry.